How to get to Dahab. Sharm El Sheik airport has a growing number of daily international arrivals making it easier than ever to get to Egypt! 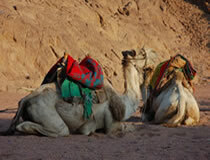 Dahab is only 100kms North of Sharm El Sheik on the East coast of the Sinai peninsula. We can organise an air-conditioned minibus, to meet you at the airport. It is a short drive to Dahab (around 1 hour). Roof racks available if you wish to bring your own kit. A really good website which shows a variety of durations and the cheapest prices from many different airlines and countries try www.skyscanner.net or www.kayak.com.